Burkina Faso's President Roch Marc Christian Kabore on Wednesday began a two-day official visit to Turkey. Kabore arrived in Ankara at the invitation of President Recep Tayyip Erdoğan, the Turkish Presidency Directorate of Communications said in a statement. Kabore began his visit by attending a Turkey-Burkina Faso business forum organized by the Foreign Economic Relations Board (DEIK). "Today we're here to strengthen our relations with Turkey at the state level and develop our economic relations," Kabore said. 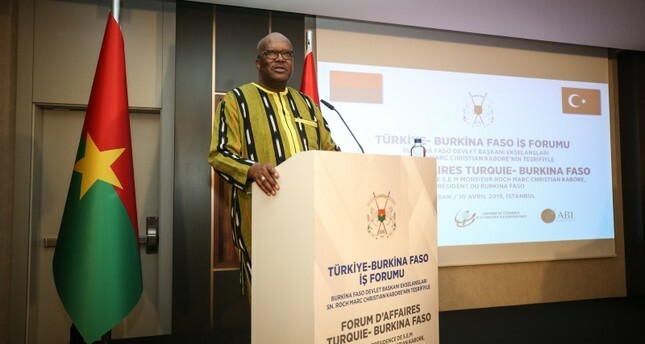 He added that Burkina Faso "greatly admires" Turkey for its reliable and innovative work, and continues to welcome Turkish businesspeople for greater investment. Burkina Faso Chamber of Commerce President Mahamadi Savadogo said at the event that the trade volume between the two countries is currently $90 million, up from $50 million in 2014. He said Turkey is the ninth largest supplier to Burkina Faso, particularly in construction and building materials. Kabore is the first president to visit Turkey from the West African country of Burkina Faso, which currently holds the rotating presidency of G5 Sahel military alliance.